I would avoid the larger markets where prices tend to be higher, the tourist traffic heavier, and the vendors less hospitable. 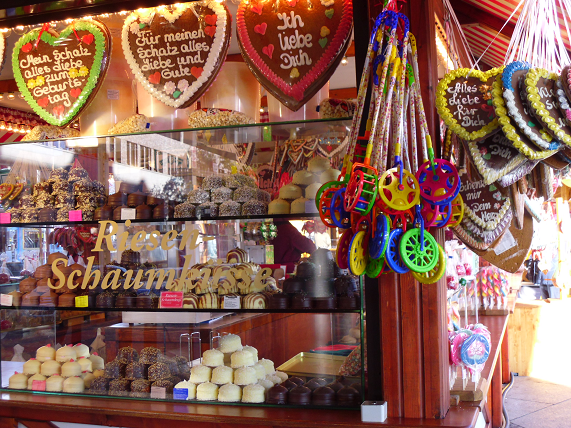 My favorite Weihnachtsmarkt is held on Sundays at Winterfeldtplatz. It’s small and cozy, and just the right place to enjoy a warm mug of Glühwein. As always, be on your guard for thieves and other unsavory characters. 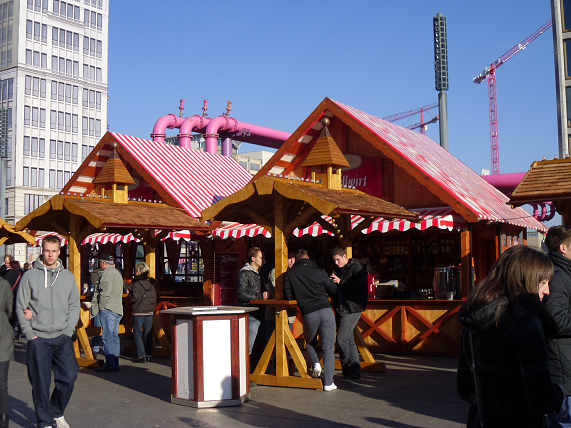 Last year, a number of Christmas market visitors became ill after drinking poisoned schnapps. According to authorities, an unidentified man offered visitors a drink to celebrate the birth of his newborn child. They quickly became ill and many required hospital attention. 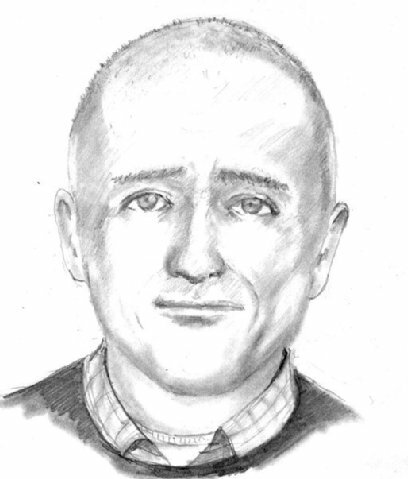 A composite drawing of the man has been posted at this year’s markets, just in case he returns. "Sechzehneichen": Another Remake of "The Stepford Wives"
Remaking a film classic is always a difficult task. Just because a movie was successful is no guarantee that a remake will also be a hit. Take the 1998 remake of Alfred Hitchcock’s Psycho. It was a disaster critically, and it bombed at the box office. Yet, Hollywood continues to recycle old material. There was Poseidon (The Poseidon Adventure) in 2006, The Stepford Wives in 2004, and Madonna’s truly abysmal Swept Away in 2002. These were real stinkers. In truth, the bad remakes far outnumber the good ones (True Grit 1969 and 2010, Invasion of the Body Snatchers 1956 and 1978). Last night, das Erste presented Sechzehneichen (Sixteen Oaks), another remake of The Stepford Wives (1975). The original film, starring Katherine Ross, Paula Prentiss, and Tina Louise, was of its time: the lure of suburbia, the rise of feminism, and the dangers of uncontrolled technologically. It’s difficult to see how another version would work in 2012. Yet, it does, and it works quiet well. Directed by Hendrik Handloegten, Sechzehneichen, is one of the most visually fascinating movies I have seen. The imagines are both real and dreamlike, and the carefully synchronized musical score by Radio Heads adds to the terror and suspense. This version pars down the narrative and focuses on the couple’s relationship. Handloegten delves into the sexual motivations behind this “ideal” community, and challenges the viewer with the questions: How does society deal with the rapidly changing roles of men and women, and does sexual equality threaten the “liberated” man? If only American TV (or American movies for that matter) could make something half as good as this. Sechzehneichen can be viewed on the Internet for a limited time. Go to das Erste and click on Mediathek. Even if you don’t understand German, it’s worth a peak. Unlike its big sisters in New York and Bilbao, the Guggenheim Museum in Berlin is modest in size and nondescript in architecture. The Museum has no permanent collection of its own, and instead hosts four exhibitions a year. In the past, these exhibitions have been unimpressive. The Guggenheim’s latest offering, Visions of Modernity, is no exception. This small collection of modern art from the late 1900’s and early 20th century is uninspired despite having the works of Picasso, Brancusi, Kandinsky, Miró, Delaunay, Cézanne, and Modigliani. There has been a lot of buzz about the exhibition, but all that buzz is just hype. In fact, the curators seemed intent on making the exhibition as dry and mundane as possible. The works are displayed in a hodgepodge fashion with little information about the individual pieces other than the title of the work and name of the artist. It reminded me of the way museums used to exhibit works of art, accessible only to people with advanced degrees in art. 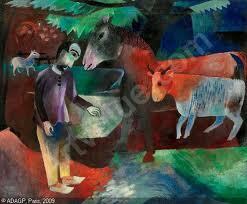 The Guggenheim foundation can present impressive and imaginative exhibitions. The Kandinsky show at the New York Guggenheim was remarkable in its accessibility and ability to tell a story. Visions of Modernity is on view until February 17, 2013, and admission is free on Mondays. One of the best things to do on a Sunday is to go out to brunch. In Berlin, brunch is an institution, and it runs from about 10 a.m. until early evening. These all-you-can eat banquets are reasonably priced (8-13€) with some great food. There are bunches specializing in Asian, Russian, Turkish, African, South American, and even German cuisine. I recently discovered Veganz, a restaurant offering a vegan brunch with dishes from around the world. (It’s not just Tofu!) Located in Prenzlauer Berg, Veganz also operates a full-scale vegan supermarket selling fresh fruits and vegetables, ready-to-eat food, cosmetics, household supplies, pet food/supplies, coffee/teas, and bakery items. And what’s surprising, the prices are comparable to those you would find at the local supermarket! 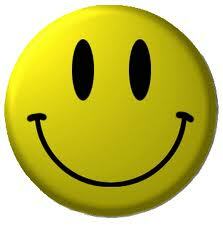 Veganz offers cooking classes, workshops, film presentations, yoga instruction, and seminars. In December, they’re offering a class on how to prepare classic Christmas dishes. Finally, Veganz has recipes and a newsletter that you can download from their website. 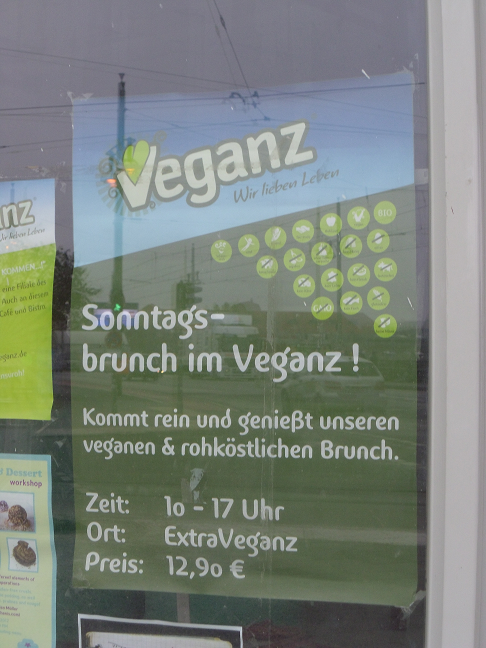 Veganz is located at Schiverlbeiner Straße 34, Prenzlauer Berg, not far from U-Bahn Schönhauser Alle.